This is a Limited Edition Starlight that is made until December 31st each Year and some proceeds go to the Starlight Foundation. 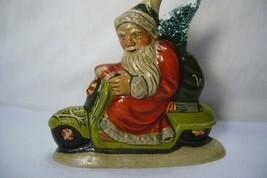 He is beautifully designed and hand painted from a antique chocolate mould. It measures 4 1/2 X 5 inches. It is in perfect condition and is boxed. MORE PHOTOS ON LISTING BELOW.